As reported by Dina Murad in her article, books are expensive in Malaysia. Most of the books sold here are imported from the United States of America (USA) and the United Kingdom (UK). Just check the back cover of a book. You can usually see the price in US dollars, Canadian dollars or British pound when that information is not covered by Malaysian pricing. When a US$12.99 book is sold for RM36.00 in Malaysia, you may think the price is justified after taking into account the exchange rate, the shipping cost and the import tax. However imagine if you are hooked on a long book series such as Nalini Singh’s Psy-Changeling series. What if you only like certain titles in the series? Would you be willing to fork out approximately RM390 for 13 books? If you rent a book at SS Readers Corner and return it before its due date, you only pay 25% of its retail price. In the case of Psy-Changeling series, you could rent each book for approximately RM8.50. If you like the books, keep them. Now there is no reason to over-spend on books when you could be using your money for other things. Visit our store to peruse our collection of 28,000+ books. 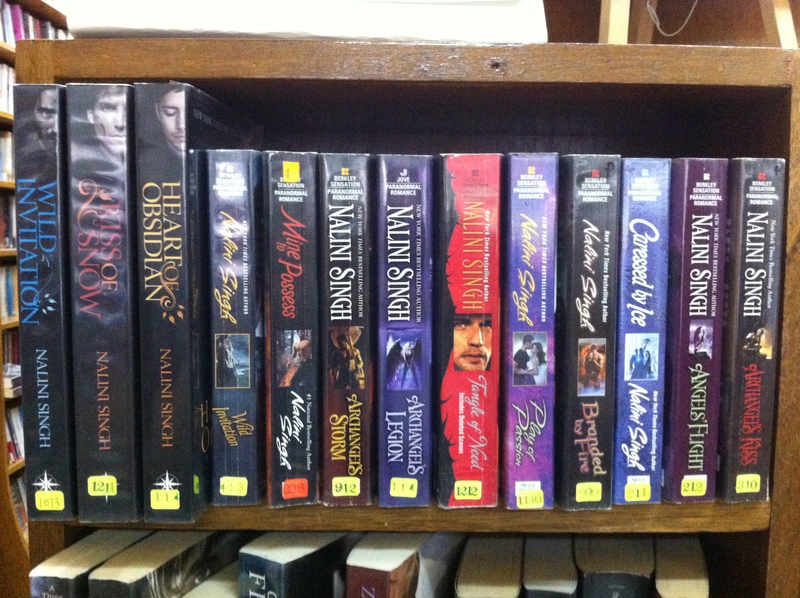 Nalini Singh’s Psy-Changeling and Guild Hunter series available in our store. ps: This is a serial of blog posts to encourage people to borrow/rent books. To read the next post, click here. This entry was tagged Benefits, Book rental, Fantasy, Malaysia, Readers, Series. Bookmark the permalink.